Preparation Step one - Whisk flour, sugar, baking powder, baking soda, and salt in a large bowl. Step two - Whisk eggs, buttermilk, and butter in a medium bowl; stir into dry ingredients until just combined (some lumps are okay). Step three - Heat a griddle or large skillet over medium heat; brush with oil. Step four - Working in batches, scoop 1/3 cupfuls of batter onto griddle. 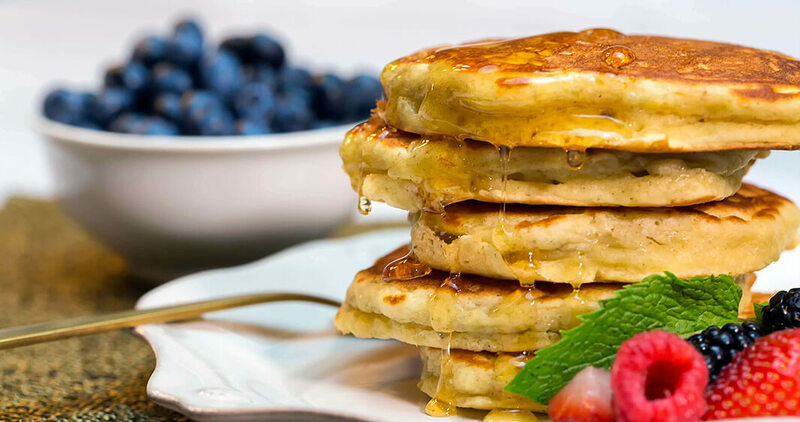 Cook pancakes until bottoms are golden brown and bubbles form on top, about three minutes. Step five - Flip and cook until cooked through and other side of pancakes are golden brown, about two minutes longer. Step six - Serve pancakes with maple syrup.